Future Awesome Camp is not like any other camps. 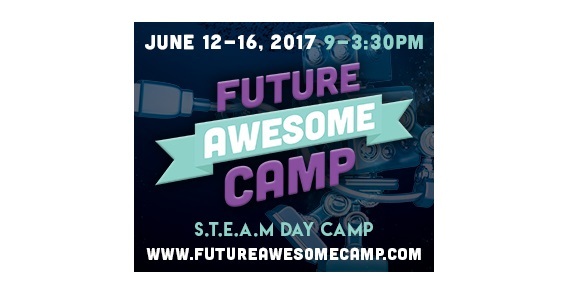 Through maker activities, use of technology, and industry mentors, Future Awesome Camp awakens children’s curiosity for STEAM. Science, Technology, Engineering, Arts and Mathematics. Children will develop life skills including; communication, flexibility, agility, adaptability, confidence, collaboration, resiliency, and problem solving in a fun and creative environment. The June 12-16th track offerings include robotics, app development, fashion, and gaming. Partnerships with industry mentors brings current knowledge of the fields and career guidance for the future. Future Awesome camp supports developing a children's unique talent, exposures to new interests, and realistic and achievable career paths. Campers leave with a well-rounded & multi lingual experience in STEAM, work portfolio, and a passion to stay curiosity. There are multiple discounts for families to ensure all children can attend. Scholarships offered. Sponsorships and partnerships are always open.